Steve Kinniburgh insists Corby Town’s Evo-Stik League South Division One Central title hopes are not over but he believes it is now Peterborough Sports’ to lose. 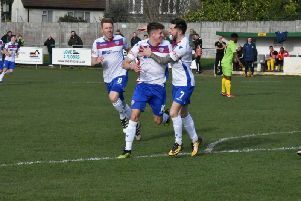 The Steelmen suffered a damaging 2-1 defeat to Dunstable Town last weekend as a six-game winning streak at Steel Park came to a shuddering halt. With Sports winning again, it means Corby head into tomorrow's (Saturday) home clash with Didcot Town sitting eight points adrift of the leaders while they are now seven behind second-placed Bromsgrove Sporting with three games in hand. Despite their recent setback, Kinniburgh remains pleased with what his team have done so far this season and they look well set to, at the very least, earn themselves a place in the end-of-season play-offs. And the manager’s main focus is on ensuring the Steelmen return to winning ways as quickly as possible. “We have had a good season so far,” Kinniburgh said. “Our last defeat before last weekend was in December so, when you look at the run we have had since then, it has been a good middle part of the season for us. “But we still find ourselves falling further behind Peterborough Sports due to the run they have been on. “You have got to look at the bigger picture from our point of view. “We have got 14 games to go and we have to set our sights on getting as many points as we can. “The title hasn’t gone but we know we are really on the chase now and if we can’t pull it off then we have to make sure we are safely in the play-offs and make sure we are prepared for that. “The ball is firmly in Peterborough Sports’ court. They have it all to lose. “The league table tells you the pressure is off us and it’s all on them to go and deliver it.